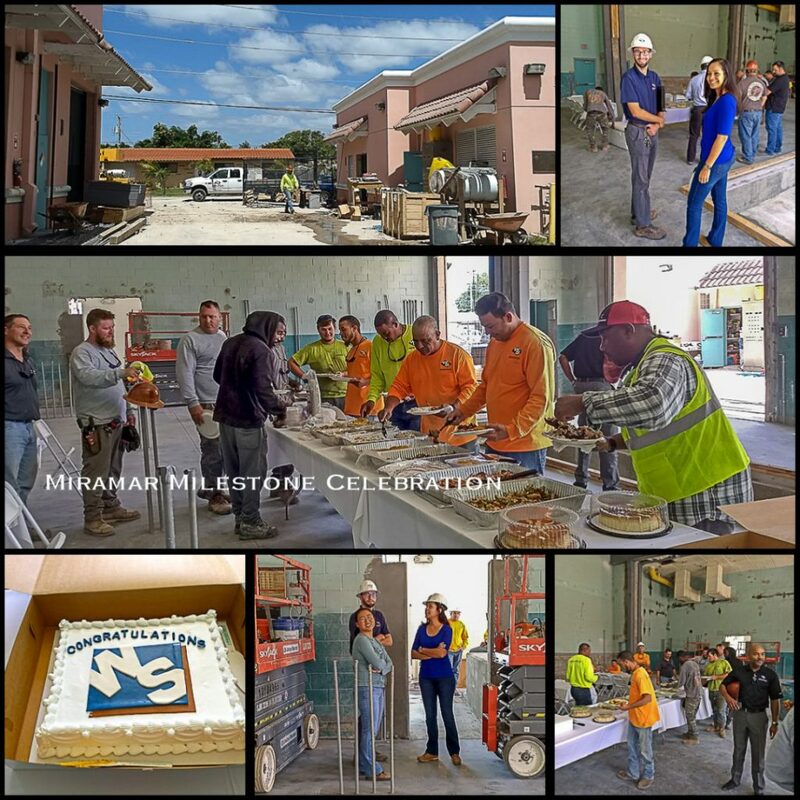 Wharton-Smith Jupiter Team at Miramar East Water Treatment Plant Reaches Milestone | Wharton Smith, Inc.
Jupiter, FL – On March 27, 2018, team members at the Miramar East Water Treatment Plant reached a milestone – placing the slab inside the Nanofiltration Building. The team celebrated with a catered lunch from the Latin Cafe and a heartfelt thank you from Division Manager Gregory Williams and Superintendent Lee Pursley. The $26.1 million project is a design-build effort with GAI Consultants to upgrade Miramar’s East Water Treatment Plant to a nanofiltration membrane water treatment facility. Nanofiltration is a membrane filtration-based method that uses nanometer sized through-pores that pass through the membrane. The team’s challenge is to retrofit the existing lime softening system built in 1955 to house the new process while keeping the existing lime softening facility in service. The project includes four Biscayne Aquifer wells, a deep injection well, a process building with four 1.5 MGD Nanofiltration membrane treatment skids, pre- and post-chemical feed systems, bulk chemical storage facilities, four high pressure feed pumps, one clearwell, one aerator, one blower, three transfer pumps, and one triplex lift station with three 50 HP end suction pumps. Construction is expected to be complete in June 2019.